This brings us to the next step, the Magnificent Life Mantra. The Magnificent Life Mantra amplifies our Divine Presence so we can be an instrument in the hands of the Divine. It melts our ego/mind into a magnificent Pink and Magenta Sun that radiates Love through every intention that we have in our life. The Magnificent Life is about the final transformation that brings our whole life into Devotion and the Pure Harmony and Bliss of God Consciousness. This experience of Devotion to God and this Universe strengthens the way our attention is moving through our life. This kind of attention is not the strength of our mind or our philosophical beliefs. It is the strength of our Presence and the way we are directing our life. True happiness and fulfillment in life happens when our intention is fulfilling the Universal Desire of God Source that wants to move through everything we do in life. 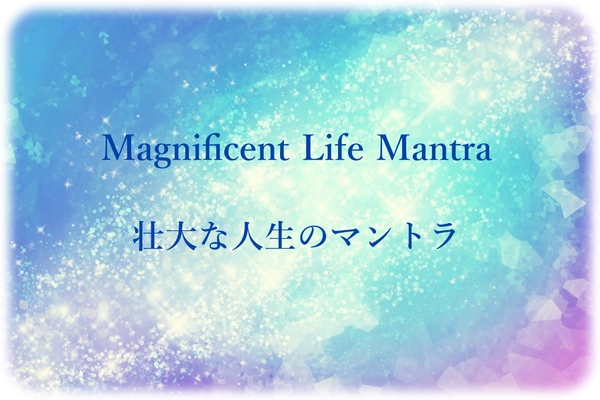 With the Magnificent Life Mantra, we visualize our Heart and our Ego united by an ever-expanding Sun that has Pink on the inside and is surrounded by Magenta on the outside radiating in all directions through every intention we create. We are living our life with Devotion to the Universe and trust the flow of our Heart to be synchronized with the flow of the Universe moving through us. This creates a tidal wave of Love/Life Force that can accomplish miracles in our daily life. Our life becomes a magnificent life in the hands of God Consciousness, the highest achievement of human consciousness.